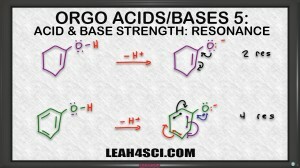 Video 5 in the acid/base tutorial video series shows you how to use conjugate base resonance to determine the strength or stability of conjugate bases. If you can logically understand how resonance effects stability you’ll have an easier time determining acidity of neutral starting acid molecules. Your videos are amazing! However, I have a doubt. We say that 1 electron carries -1 charge. But here when we transfer 2 electrons as a ‘lone pair’ we still transfer -1 charge. We should transfer -2 charge? Sorry if my doubt is stupid, I’m just trying to learn. Hello! How are you? I want to appreciate to you.. you are doing good for all of us. you are leading me very well in chemistry. I am too much crazy to learn about chemistry. I hope you will help me more and more for my easiness. Your video are extremely helpful! Thank you so much for sharing. You are very welcome Latonya. Are you in orgo 1 or orgo 2?